Gray dogwood is a deciduous shrub which is native to Missouri and typically occurs in moist or rocky ground along streams, ponds, wet meadows, glade and prairie margins, thickets and rocky bluffs. 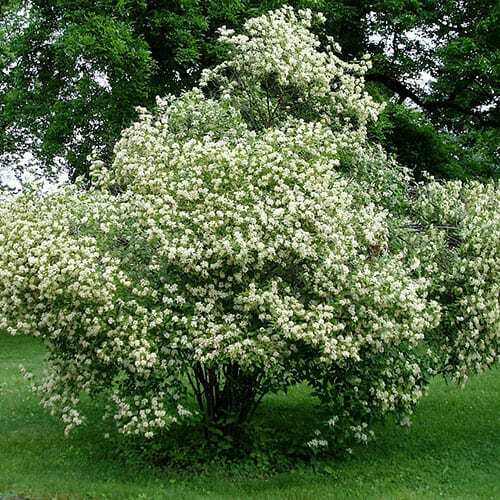 It grows 10-15′ tall and features white flowers borne in terminal racemes (hence the species name of racemosa) in late spring and grayish-green, elliptic to lance-shaped leaves (2-4″ long). Foliage turns an interesting (but not always showy) dusky purplish red in fall. Terminal stems holding the flowers are distinctively red and provide interesting contrast to the clusters of small white berries which form after the flowers have dropped. Red stem color is more easily seen after the fruits are gone, and red color often persists into early winter.